Would love to have you join us for the challenge this month. 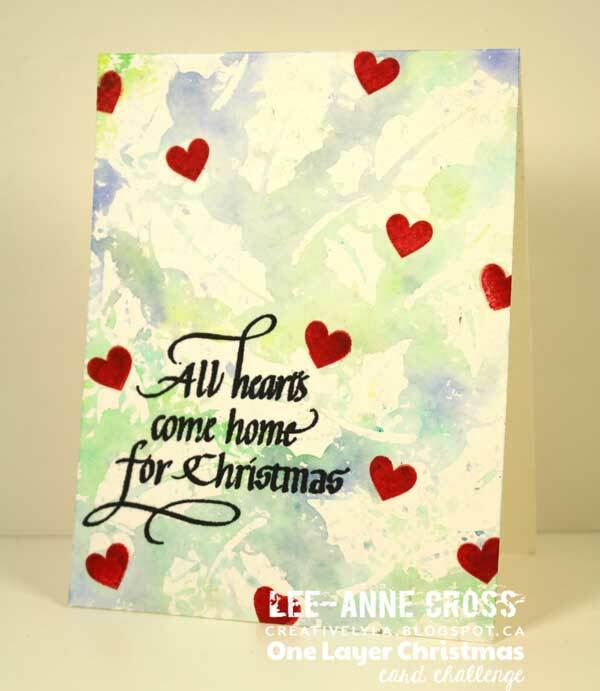 As always, it’s an anything goes challenge that must be a mixed media piece…tags, art journal pages, home decor, etc….anything but a card. 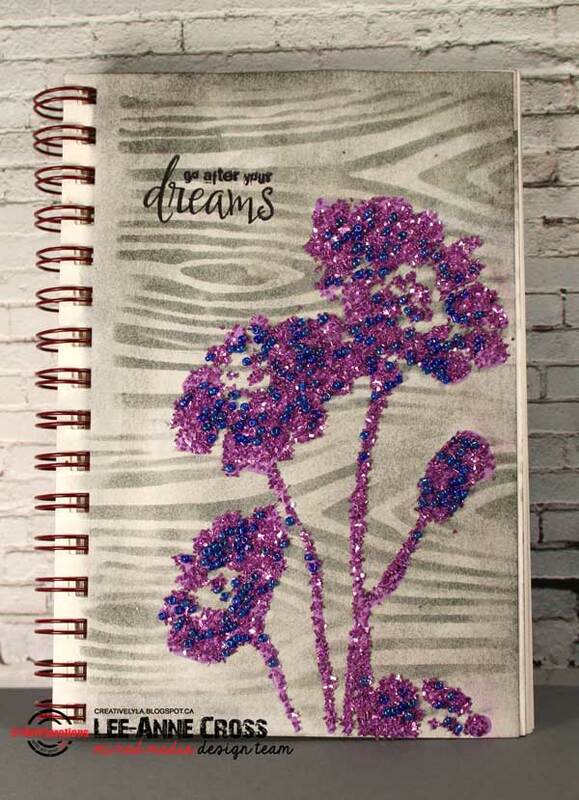 The winner will receive a $15 STAMPlorations gift certificate or 2 ARTplorations stencils. 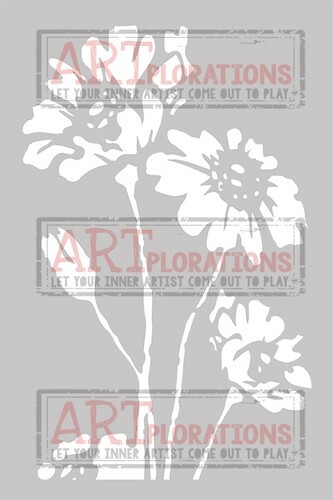 And the top picks receive an ARTplorations stencil of their choice. I’m back with another One Layer Christmas card challenge. The challenges are always one layer, always anything goes and this week’s optional twist is “family”. As always, the challenge is to create a one layer card only and if you use the optional twist, you’ll be entered into the monthly random drawing. Each card = one entry, so feel free to enter often to increase your chances to win. When I think of family at Christmas, it’s all about everyone being together…hence my use of this sentiment. Using the ARTplorations Holly Background stencil and my Distress Inks, I used the stencil monoprint technique for my background. Love the soft colors with that stencil! A simple stamped sentiment and some scattered heart hollyberries and done! It’s my turn for another Stencil Sunday project. I’ve taken some Distress Ink directly to the paper and then misted it with water. 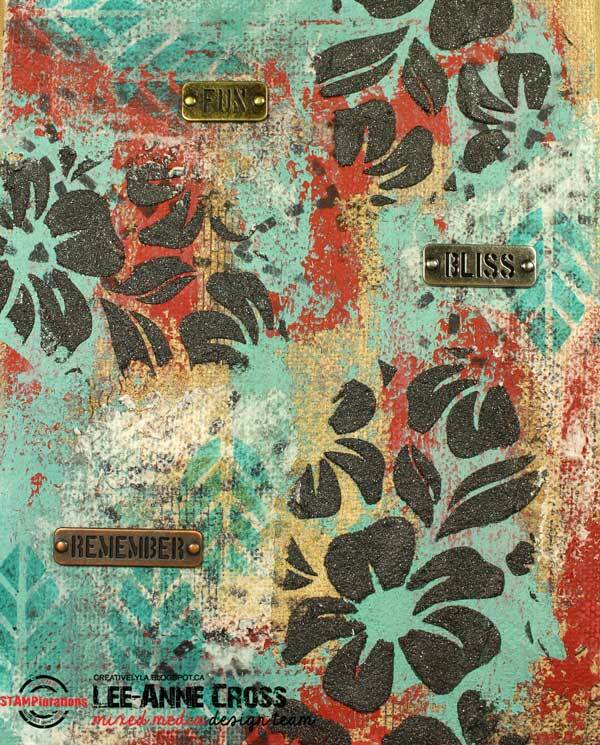 Next, I used the same color of Distress Ink through the Weathered Wood stencil. A mixture of heavy gesso, a re-inker and some acrylic paint created my paste for the Happy Flowers stencil. Before it was dry, I added some glass glitter and beads. 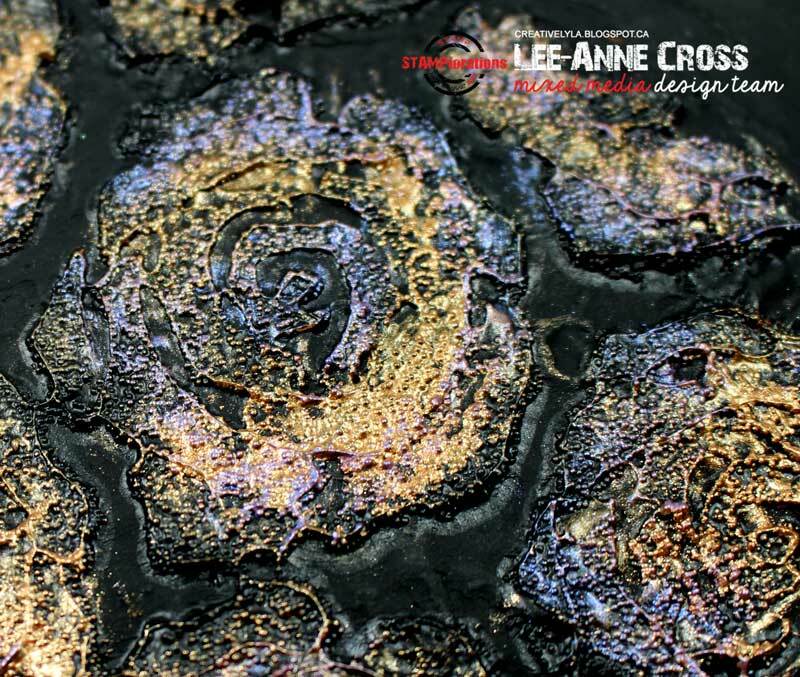 Just today and tomorrow left to enter the monthly Mixed Media Challenge for your chance to win at $15 STAMPlorations gift certificate or any 2 ARTplorations stencils. 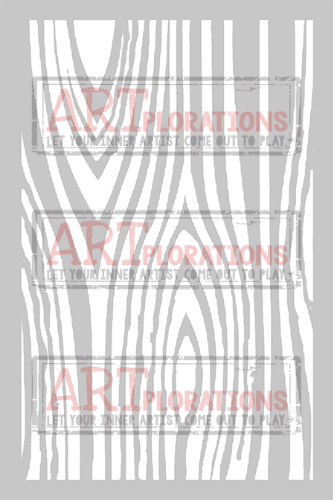 The top picks will receive their choice of an ARTplorations stencil. Hi, everyone! I’ve got a tutorial over at STAMPlorations today featuring this burlap canvas. Just a quick reminder to get your cards in for the current Mixed Media Card Challenge…you still have lots of time! One can never have enough birthday cards on hand, nor can there ever be too many butterflies on cards right *grin*? I inked up my Shower of Flutters stencil with three shades of Distress Inks, spritzed it with water and placed it on my watercolor paper. 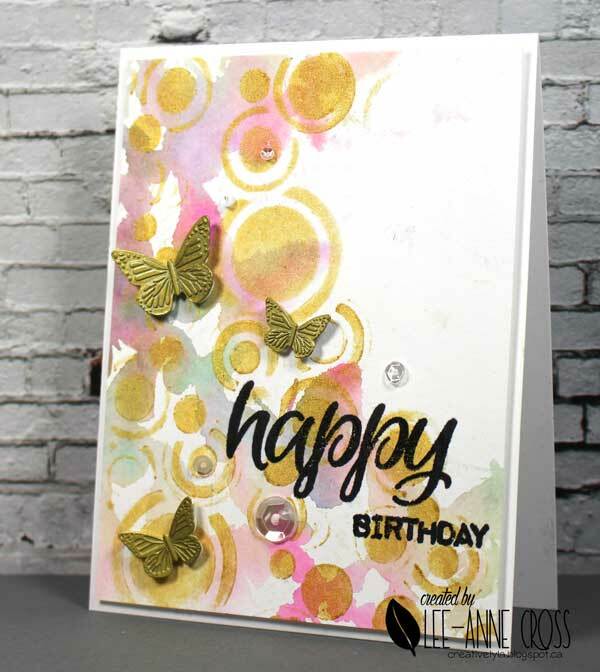 Once that was dry, I added gold ink through my Retro Circles stencil and then heat embossed with clear embossing powder. The sentiment is from Happy Sentiment Builders. 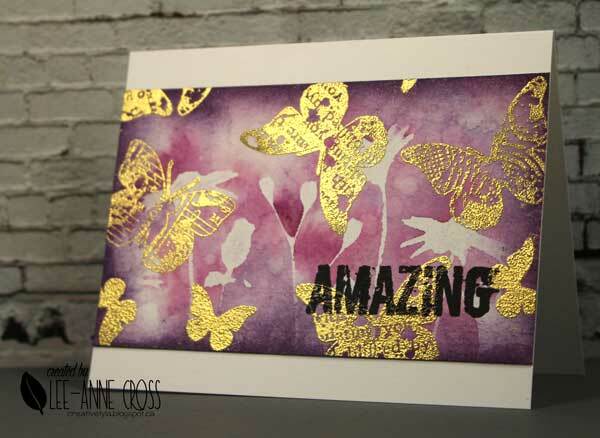 A smattering of sequins and some gorgeous gold butterflies and done! I recently found those little gold butterflies for a steal at our Winners/HomeSense store. Don’t you just love a bargain? 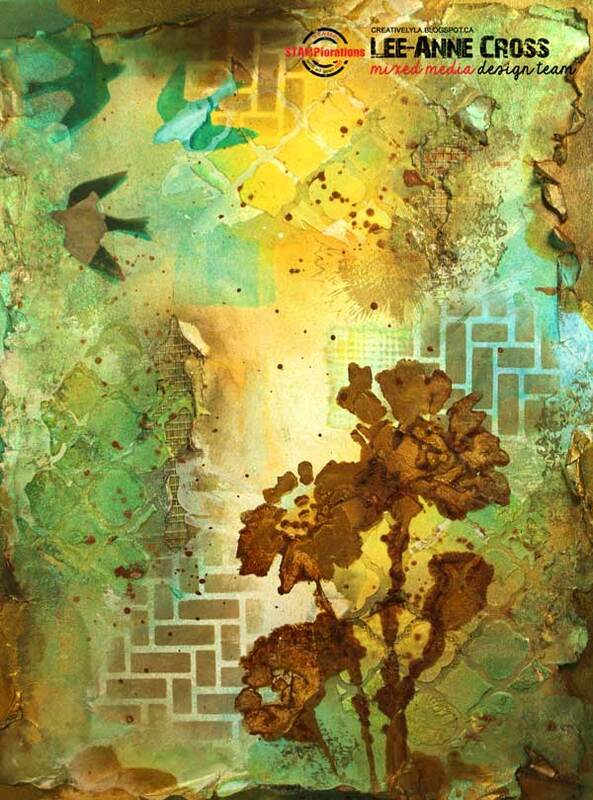 I’m back with another Stencil Sunday mixed media piece…again, my inspiration comes from my garden. But please note…my flowers are not brown *grin*. This piece starts out by adding clear gesso to a piece of masonite. Once that was dry, I added a piece of designer paper that was heavily distressed with a distressing tool and ink. I also cut out little holes and added some drywall tape behind the holes before adhering it to the masonite. Next comes some gesso, some light modelling paste through a stencil and lots of ink sprays. I used the colors from the designer paper to choose the ink sprays. More stenciling with archival inks, distress inks and acrylic paints. When using acrylic paints, it can get a bit messy (i.e. I can make it totally messy) and you don’t always get a clean image, especially over pastes, etc., but in my mind that’s completely ok! It adds to the individuality of the piece. As a final touch I added more sprays, acrylics and inks around the edges of the piece. Check out all the amazing designs from the rest of the Design Team right here!